A Spokane great-grandmother will be honored in Olympia next week for her work as a teenage Dutch Resistance operative during World War II. Carla Olman Peperzak, 91, helped hide approximately 40 Jews from the Germans. She also forged identification papers, served as a messenger and helped publish a newsletter for the underground movement. “Carla is a person of incredible grace and heroism. I’d like her story told as far and wide as possible,” said Sen. Andy Billig, D-Spokane. This May marks the 70th anniversary of the end of World War II in Europe. Billig contacted Peperzak shortly after a Jan. 25 story about Peperzak’s resistance work appeared in The Spokesman-Review. Billig has known Peperzak for several years through the local Reform congregation, Emanu-El, where both are members. She’s also one of his constituents. Billig first heard her story about three years ago when Peperzak spoke to a group of children from the congregation. His daughter, now 15, was sitting next to Peperzak “looking up at her and locked on every word” as she spoke. The article “put (Peperzak’s story) back in the front of my mind,” Billig said. Peperzak was 16 when the German occupation started in her native Holland in the spring of 1940. She was 18 when she first helped a family go into hiding. “I did not have any responsibility – only for myself – and that made a big difference. I felt I could help. I had the opportunity,” Peperzak told The Spokesman-Review in January. Peperzak’s father was able to procure papers identifying his wife and two daughters as non-Jewish because Peperzak’s mother was born into a Catholic family. Peperzak grew up in Amsterdam a block away from the Frank family: Anne, the famous diarist, as well as her older sister Margot and parents Otto and Edith. Peperzak was in the same Hebrew class as Margot, and they attended the same Reform temple. Only Otto Frank survived the Holocaust. Holland had one of the highest Jewish death rates of Western Europe in World War II. About 35,000 of the approximately 140,000 Jews in Holland survived. Peperzak estimates 75 percent of her relatives perished at the hands of the Nazis. A couple of years after it ended, Peperzak left Amsterdam. She became a U.S. citizen in 1958 and moved to Spokane in 2004. 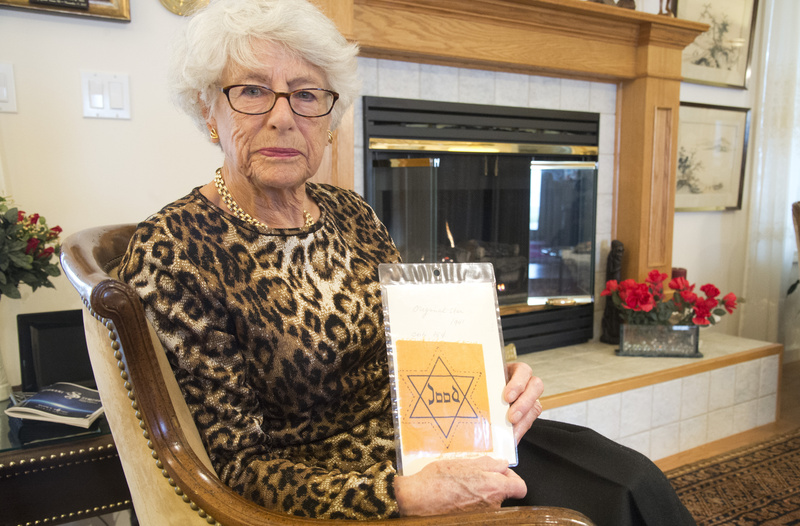 She’s a member of Emanu-El as well as Temple Beth Shalom, where she helps organize an annual Holocaust commemoration. This year’s event takes place at 7 p.m. April 19 at the temple, 1322 E. 30th Ave.
After decades of silence on the subject, Peperzak now shares her story of the wartime resistance at schools and other venues throughout the region, about a half-dozen speaking engagements a year. Three of her four children, plus two of their spouses and a couple of her grandchildren, are planning to attend the ceremony in Olympia. “I am especially grateful that people again are made aware of what really happened in the hope that it will never happen again,” Peperzak said.